The Independent Watchdog (IWDG) allows the developer to detect software failures and reset the STM8S microcontroller restarting the application. This post demonstrates how this feature works and how the developer can change the time window for the watchdog. Watchdogs offer the application developer a simple to use method of determining if an application has entered a state which means that it is locked or taking too long to perform an operation. The first task is to define what we mean by too long. This will vary from one application to another but the key point is that this should be longer than the longest operation the application will perform plus a margin. Once we have this time period defined we know that the application must reset the IWDG before the time period has elapsed. 0x55 Enable writing to the IWDG_PR and IWDG_RLR registers. These registers are write protected by default. 0xAA Reset the IWDG counter to the reload value. This value must be written to the key register periodically in order to prevent the watchdog from resetting the microcontroller. 0xCC Enable and start the IWDG. 0x00 Disable writing to the IWDG_PR and IWDG_RLR registers. 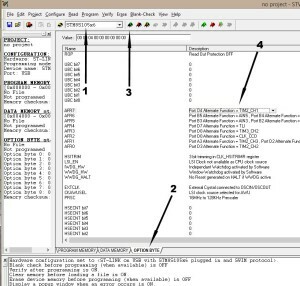 The final value in the table is not present in revision 9 of RM0016 – Reference Manual but does appear in the header files for the STD Peripheral Library. In researching this post a key point in the documentation was missed, namely IWDG_PR and IWDG_RLR can only be written when the IWDG has actually been enabled. This means that the IWDG needs to be running before the prescaler and reload registers can be loaded with the values required by the application. If the IWDG is not running then the system will resort to the default reset values for these registers. This gives a watchdog window of 16ms. It also means that the application has 16ms to set the desired time window through the IWDG_PR and IWDG_RLR registers before the microcontroller is reset. Additionally, the time between the last reset of the key register (i.e. writing 0xAA to IWDG_KR) is T + 6 x TLSI. The code above should be pretty familiar to anyone who has been following The Way of the Register series of posts. This sets up the system clock to run at 16MHz and sets port D as an output port. IWDG_KR = 0xcc;         //  Start the independent watchdog. IWDG_KR = 0x55;         //  Allow the IWDG registers to be programmed. IWDG_RLR = 0x04;        //  Reload counter. IWDG_KR = 0xaa;         //  Reset the counter. We follow this up by setting up the IWDG. The prescaler and counter values should give a 1ms window. The main program configures the system and then halts the microcontroller. Without the watchdog this would the end of the application. With the watchdog we should see the microcontroller continuously resetting. This can be verified by connecting an oscilloscope to Port D. If we do this we see the output on the port rise as the microcontroller is reset and the InitialisePorts method is called. This code continuously writes the I am alive message to the IWDG key register. Doing this forces the IWDG to reset the counters with the reload values and start again. Running this application we see a flat line following the initial reset of the microcontroller. The flat line indicates that the microcontroller is not being reset. The Independent Watchdog provides a simple method for detecting software failures merely writing a reset value into the key register. Earlier the point was made that it appears that the IWDG must be enabled (and hence running) before the prescaler and reload registers can be modified. This point is critical as the microcontroller will resort to the reset values otherwise. Although not demonstrated here it is possible for the application to determine if the application has been started through the application of power to the microcontroller or because of a reset by the IWDG. This can be determined by checking the value in RST_SR_IWDGF. This will be set to 1 if the IWDG has caused the microcontroller to be reset or 0 otherwise. This is left as an exercise for the reader. The source code for this post is available for download. A few days ago I was asked for advice about pausing the STM8S for a long time period (in this case 30 seconds). I had to admit that I was not sure how to achieve this without using a timer and counting interrupts until the 30 time period had expired. A quick examination of the STM8S Programming Reference reveals that there is a simpler way of doing this. This post examines the Auto-Wakeup (AWU) feature of the STM8S and shows how this feature can be used to pause for a time period which can range from 15.625uS to 30.720s, assuming the clock source is accurate. The AWU feature wakes the STM8S after a predefined time period following the microcontroller going into the active halt state. This feature can only be used when the microcontroller is halted and the accuracy is dependent upon the clock source. The clock source is fed into a prescalar. The output from the prescalar is then used as a clock for a counter. The counter will cause an interrupt to be generated when the preset counter value has been reached. It is also possible to determine the accuracy of the clock source by using the capture compare feature of TIM1 or TIM3 to measure the clock frequency. The function of the AWU is determined by the values in the AWU control registers. Setting this bit to 1 enables the AWU function. Setting this to 0 disables the function. These two registers together control the duration of the AWU. The exact duration of the wakeup period is determined by the AWU_APR_APR and AWU_TBR_AWUTB values from the following table. Where fLS = f is the formula which should be used when the inbuilt LSI is not being used. It may not be possible to obtain an exact time period and the application may have to use the values which give the closest period. When not in use, AWU_TBR_AWUB should be set to 0 in order to reduce power consumption. This flag is set when the AWU interrupt has been generated. The flag is cleared by reading the AWU control/status register (AWU_CSR1). Setting this flag to 1 connects the output from the prescalar to one of the internal timers. This allows the application to accurately determine the clock frequency connected to the AWU prescalar. By measuring the clock frequency the application can adjust the values used for the prescalar divider and the timebase. //  Initialise the Auto Wake-up feature. AWU_CSR1_AWUEN = 0;     // Disable the Auto-wakeup feature. AWU_CSR1_AWUEN = 1;     // Enable the Auto-wakeup feature. Firstly, the AWU function is disabled. The prescalar is set followed by the timebase. The final step is to re-enable the AWU. //  Auto Wakeup Interrupt Service Routine (ISR). //  pulse on the oscilloscope. reg = AWU_CSR1;     // Reading AWU_CSR1 register clears the interrupt flag. This interrupt handler is triggered at the end of the AWU period. This handler simply pulses pin 0 on port D.
The AWU function is turned on when the microcontroller enters the active halt state. A halt instruction is generated by the __halt() method. Examining the table above and the values used for the precalar and timebase we should be seeing a pulse with a frequency of approximately 3,368Hz. The actual value measured on the oscilloscope is 3,208Hz. The measurement on the oscilloscope will alway be slightly out due to the time it takes for the ISR to be setup and called. An ISR on the STM8S takes 9 clock cycles to be established, this equates to about 560nS on a system running at 16MHz. The actual difference is 6.25mS. The remainder of the difference comes from the fact that the LSI has an accuracy of +/-12.5%. A quick calculation shows the the LSI was running at about 121KHz at the time this post was written. AWU offers a simple way of triggering processing at predetermined time periods. The active halt state puts the microcontroller into a low power mode whilst the microcontroller is waiting for the time period to elapse. It should also be noted that using the LSI results in a slightly variable time period. During a recent project it became desirable to store a small amount of data in some non-volatile memory in order that the system state could be restored following loss of power. This article demonstrates how to achieve this by writing a small amount of data to the data EEPROM of the STM8S105Cr micro-controller on the STM8S Discovery board. The Data EEPROM area of the STM8S series of micro-controllers varies depending upon the specific unit being used. For this article the specific micro-controller being used is the STM8S105C6 on the STM8S Discovery board. This micro-controller has 1KByte of EEPROM in the address range 0x4000 – 0x43ff. By default the data area is write protected and cannot be modified by the main program. The write protection is removed by using a key to unlock the EEPROM data area. The flash program area is similarly protected but we will only consider the data EEPROM area. In order to write to the EEPROM area the application will need to write two security keys called Memory Access Security System (MASS) keys to the FLASH_DUKR register. These keys will unlock the EEPROM area and allow the application to write data to the EEPROM until the application turns write protection back on. Check the DUL bit of FLASH_IASPR. If this bit is set then the data area is writeable and no further action is required. Write the first MASS key (0xae) to the FLASH_DUKR register. Write the second MASS key (0x56) to the FLASH_DUKR register. At the end of the process of successfully writing the MASS keys the DUL bit of the FLASH_IASPR register will be set. This bit will remain set until either the application changes the bit or the micro-controller is reset. Resetting the DUL bit programatically reinstates the write protection for the EEPROM memory. This feature is not available on all of the STM8S family of processors and you should consult the data sheet for the unit being used if you are interested in using this feature. The RWW feature allows the program memory to be read whilst the EEPROM memory is being written to. Byte level programming is available for both the program memory and the EEPROM memory. To use this feature the application simply needs to unlock the EEPROM using the MASS keys and then write individual bytes into the EEPROM memory. To erase a byte simply write 0x00 into the memory location. The STM8S also allows word (4 bytes) and block programming. Both of these are faster than byte programming and block programming is faster than word programming. These features will not be discussed further here and are mentioned simply for awareness. Illegal operation (writing to protected pages). Interrupts are enabled by setting FLASH_CR1_IE to 1. When this bit is set, an interrupt will be generated when the FLASH_IASPR_EOP or FLASH_IASPR_WR_PG_DIS bits are set. The original aim of the software was to write a small amount of data to the data EEPROM of the STM8S and use the ST Visual Programmer to verify that the memory contents had changed. As the project progressed it became apparent that we would also need some code to verify the data. //  Write a series of bytes to the EEPROM of the STM8S105C6. //  Data to write into the EEPROM. //  Write the default values into EEPROM. //  Check if the EEPROM is write-protected. If it is then unlock the EEPROM. //  Write the data to the EEPROM. char *address = (char *) 0x4000;        //  EEPROM base address. //  Now write protect the EEPROM. The application simply enables writing to the EEPROM and then writes data to the memory. It also re-enables the write protection at the end of the write operation. This time the data looks good and the values appear to be correct. Downloading the EEPROM data again gave the first set of results. Trying for a fourth thime gave the second set of results. It appears that the correct data is only retrieved every second attempt (for reference, I am using ST Visual Develop version 3.2.8 on Windows 8). //  verify that the data has been written correctly. PD_ODR_ODR3 = 0;            //  No errors. PD_ODR_ODR2 = 0;        // Finished processing. //  Setup port D for data output. PD_DDR = 0xff;          //  All bits are output. PD_CR1 = 0xff;          //  All pins are Push-Pull mode. PD_CR2 = 0xff;          //  Pins can run up to 10 MHz. Pin D2 is connected to the yellow channel and pin D3 is connected to the blue channel. The above shows that the verification process starts and no errors are generated. There may only be a small amount of EEPROM storage space available on the STM8S (640 bytes to be precise) but this offers a quick and simple method of storing data which may be needed between system resets/power loses. In it’s simplest form, the code required to store the data is trivial only requiring the developer to enable the write operations and then disable after the data has been written successfully. In addition to the above I would recommend that some form of checksum value is written into the EEPROM as it is possible that the power is lost as the data is being written into the EEPROM. In this case there are two arrays being written and we may only have written half of the data when the power is lost. This is left as an exercise for the reader. So far in The Way of the Register series we have only looked at SPI from a slave device point of view as we have been working towards creating a Netduino GO! module. For every slave device there must be a master, here we will look at configuring the STM8S to operate in SPI master mode. The project will look at controlling a TLC5940 in order to emulate the work described in the post TLC5940 16 Channel PWM Driver. We could simply bit-bang the data out to the chip but instead we will use the SPI interface to achieve this. See the quoted post for a description of how this chip works and for an explanation of the terminology used. The TLC5940 generated 4,096 grey scale values by using a PWM counter. Once the counter reaches 4096 pulses it stops until it is told to restart. The Blank pulse acts as a restart signal. This project will be controlling LEDs and so will want to continuously keep the counter running. If we did not keep the counter in the TLC5940 running then the LEDs would light for a short while and then simply turn off and remain off. CLK_CCOR = 0;   //  Turn off CCO. CLK_CCOR = 1;   //  Turn on CCO. CLK_CCOR = 1;                       //  Turn on CCO. //  Setup Timer 2 to generate an interrupt every 4096 clock ticks. TIM2_PSCR = 0x00;       //  Prescaler = 1. TIM2_ARRH = 0x10;       //  High byte of 4096. TIM2_ARRL = 0x00;       //  Low byte of 4096. TIM2_IER_UIE = 1;       //  Turn on the interrupts. //  Setup the output ports used to control the TLC5940. PD_DDR_DDR4 = 1;        //  Port D, pin 4 is used for the Blank signal. PD_CR2_C24 = 1;         //  Port D, Pin 4 is generating a pulse under 2 MHz. The single pulses are being generated at a frequency of approximately 3.9kHz. A little mental arithmetic dividing the 16MHz clock by 4,096 comes out to about 3,900. This shows that the signal is 125nS wide. This is acceptable as the minimum pulse width given in the data sheet is 20nS. So at this point we have the 16MHz grey scale clock signal and the Blank pulse being generated every 4,096 clock pulses. You will note that the serial data and clock are currently connected to PD5 and PD6 respectively. Whilst the eventual aim is to communicate with the TLC5940 via SPI, the initial communication will be using Bit-Banging. We will move on to using SPI once the operation of the circuit has been proven using tested technology. The first changes we will have to make create some #define statements to make the code a little more readable. We also add some storage space for the grey scale and dot correction data. //  Define which pins on Port D will be used as control signals for the TLC5940. //  XLAT - A high pulse causes the data to be transferred into the DC or GS registers. //  VPRG - Determines which registers are being programmed, High = DC, Low = GS. //  Values representing the modes for the VPRG pin. //  Next we need somewhere to hold the data. The Bit-Banging methods should look familiar to anyone who has been reading any of the posts in The Way of the Register series. //  is shifted in on the rising edge of the clock. //  Bit bang a buffer of data. //  Send the grey scale data to the TLC5940. //  Send the dot correction buffer to the TLC5940. //  data from the latches into the appropriate registers. //  Set the brightness of an LED. We should also create a similar method for changing the dot correction value for an LED. This is left as an exercise for the reader as we will not be changing this value in this code. If we have connected the TLC5940 correctly and our code works we should be able to connect up some LEDs (common anode) to the TLC5940 and change the brightness under program control. TIM2_CR1_CEN = 1;       //  Finally re-enable the timer. Having arrived here we now know that the circuit has been connected correctly and that the control logic in the main method works. We can now move on to considering what we need to do in order to use SPI in master mode. The aim will be to simply remove the Bit-Banging methods and replace these with an interrupt driven SPI master algorithm. So now we have a working circuit we need to look at SPI on the STM8S. Firstly let’s remind ourselves of the serial communication parameters for the TLC5940. This chip reads the data on the leading clock edge (CPHA = 1). We have also set the clock idle state to low (CPOL = 0). It is also advisable to start off using the lowest clock speed for SPI in order to confirm correct operation of the software and circuit. Lower speed are less likely to be subject to interference. You should review the previous articles on SPI communication if you are not already familiar with the SPI registers we have used so far. In this post we will only discuss the new settings required to switch from being a SPI slave device to a SPI master device. The SPI baud rate is calculated as fmaster / divisor. So for our master clock speed of 16MHz we get the lowest clock speed of 16,000,000 / 256, or 62,500Hz. Setting this bit switches SPI into master mode (see also SPI_CR1_SPE). Note that the reference for the STM8S also states that this bit (and SPI_CR1_SPE) will only remain set whilst NSS is high. It this therefore essential to connect NSS to Vcc if this device is not being used as a slave device. Using SPI presents us with a small problem, namely the program will have to start to operate in a more asynchronous way. The code presented so far has only one interrupt to be concerned with, namely the timer used to control the Blank signal. Adding SPI to the mix means that we will have to also consider the SPI interrupt as well. It also adds the complication of sending dot correction data followed by grey scale data. This last problem will not be covered here and is left as an exercise for the reader. //  Initialise SPI to be SPI master. SPI_CR1_SPE = 0;                    //  Disable SPI. SPI_CR1_CPOL = 0;                   //  Clock is low when idle. SPI_CR1_CPHA = 0;                   //  Capture MSB on first edge. SPI_ICR_TXIE = 1;                   //  Enable the SPI TXE interrupt. SPI_CR1_BR = 7;                     //  fmaster / 256 (62,500 baud). SPI_CR1_MSTR = 1;                   //  Master device. Much of the code should be familiar as it has been used in previous posts discussing SPI slave devices. Not however that we do not enable SPI at this point. We simply set the scene for us to use SPI later. //  SPI Interrupt service routine. //  Check for an overflow error. //  Check if we have more data to send. The main works starts when we have established that the transmit buffer is empty (SPI_SR_TXE is set). If we have more data then we put the byte into the data register (SPI_DR). If we have transmitted all the data we have then we wait for the last byte to complete transmission (SPI_SR_BSY becomes false) before we start to terminate the end of the SPI communication. Making these changes and running the code shows that the system operated as before. A little experimentation is called for. Being ambitious I started with a clock frequency of 1MHz. This resulted in a flickering effect on the LED display. So, 1MHz is too ambitious, let’s start to reduce the frequency. I finally settled on 250 KHz as this allowed the circuit to function as before. As you can see, there is a lot of opportunity for interference with all those flying leads. 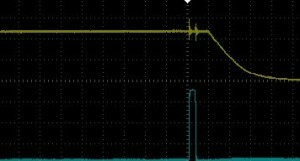 While the time taken might have increased, the load on the microcontroller will have decreased as the SPI method is interrupt driven. The actual transmission is off-loaded to the microcontrollers dedicated circuitry. As usual, the source code for this project is available to download. At the end of this post you should be able to configure the system clock and introduce a known delay subject to the tolerances of the system clocks. As already noted, each clock can be turned on/off as required. Turning an unused clock off reduces the power consumption of the microcontroller. The first three clocks are used to drive the system clock for the microcontroller. The final two are low speed clocks and are primarily used to drive the watchdogs. After reset, the STM32 enables the HSI oscillator. This has a relatively low accuracy, only 1%, but is suitable for most applications. Using the HSI oscillator eliminates the need for an external clock in the final circuit design. On the STM32F4, the HSI oscillator has a clock speed of 16 MHz. 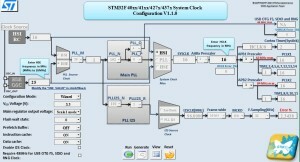 The STM32 can operate using an external clock circuit. 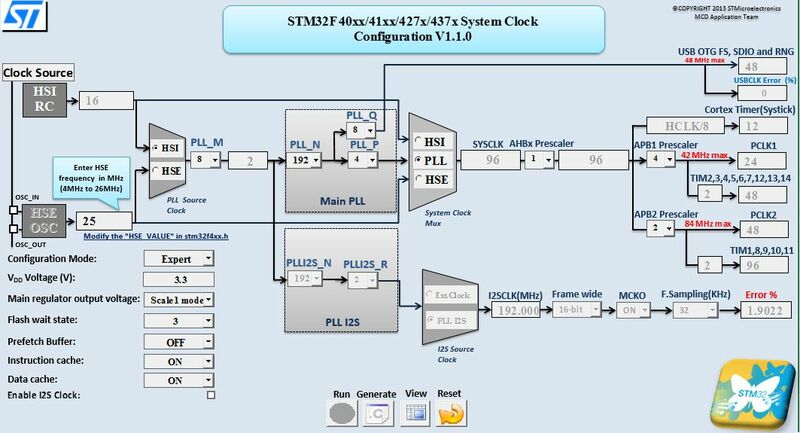 It is possible to design an external clock to run with a greater accuracy than the internal HSI clock enabling finer control of the operating parameters of the final circuit. The exact specification of the external clock frequency varies but is typically 4-16 MHz. 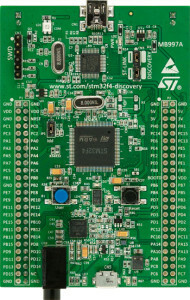 The STM32F4 Discovery Board has a built in external oscillator circuit fitted with a 8 MHz crystal. The PLL is used to multiply it’s input clock source by a factor varying between 2 to 16. The input of the PLL is one of HSI, HSE or HSE/2. It is important to note that the configuration of the PLL cannot be changed once it has been enabled. The LSI is a low power clock used for the watchdog timers. The LSE is powered by an external 32.768 KHz clock. This provides a method of providing a low speed accurate clock for the real time clock. Each of these clocks can be scaled using prescalers. A fuller picture of the types of clocks and their relationships can be found in the STM32 Reference Manual (RM0090). The system clock is used to determine the speed at which instructions are executed and has a maximum speed of 168MHz. Derived from the system clock, this bus has a maximum speed of 168MHz. Derived from AHB, this bus has a maximum speed of 42MHz. Derived from AHB, this clock has a maximum frequency of 84MHz. A number of the peripheral clocks are not derived from the system clock but have their own independent source. These clocks are all driven by an independent output of the PLL. The maximum speed for these peripherals is 48MHz. The I2S peripherals have their own internal clock (PLLI2S). Alternatively, this can be derived by an independent external clock source. These clocks are derived from an external source. The STM32 provides the ability to output up to two clocks to the external circuit using the Microcontroller Clock Output (MCO) pins. Both of the outputs can have a prescaler applied. This can be in the range 1 to 5 inclusive. Microcontroller Clock Output 1 (MCO1) is output on pin PA8. MCO1 output can be one of HSI, LSE, HSE or PLL scaled appropriately. Microcontroller Clock Output 2 (MCO2) is output on pin PC9. MCO2 output can be one of HSE, PLL, System Clock or PLLI2S scaled appropriately. The clock output is configured by selecting the appropriate alternative function for the GPIO port and is restricted to 100MHz. 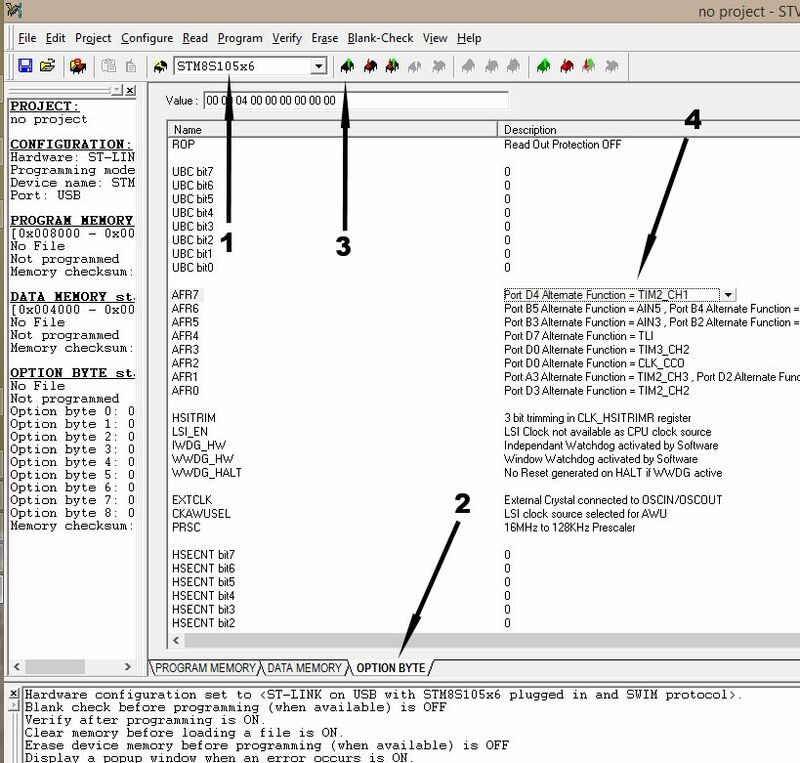 The number of features on the STM32F4 analysis and discussion of the registers and their function large. Luckily ST have come to the rescue and provided a configuration tool to help. This Excel spreadsheet can be run in both Expert and Wizard mode making it suitable for a wide range of users. The grey number in the above illustration have been calculated whilst the numbers in black can be changed by the users. //  Initialise the peripheral clock. //  Initialise the GPIO port. //  Toggle Port D, pin 0 indefinitely. If we run the code above with the SystemInit line commented out and hook an oscilloscope up to pin 0 of port D we get a square wave output with a frequency of about 1.5MHz. Now uncomment the SystemInit line of code and re-run the example. This time we see that the output signal has a frequency of nearly 4.9MHz. Turning the configuration tool into expert mode and tweaking a few of the parameters allows the frequency of the output signal to go to 8.77MHz. Timings are based upon the optimisation level being set to no optimisation. 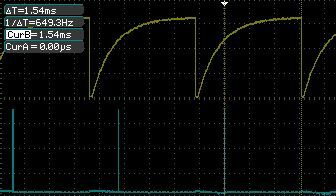 Turning the optimisation on to the maximum speed allows an output signal of nearly 20MHz to be generated. The STM32 contains a variety of clock sources and configuration using the registers within the microcontroller would be a complex task. 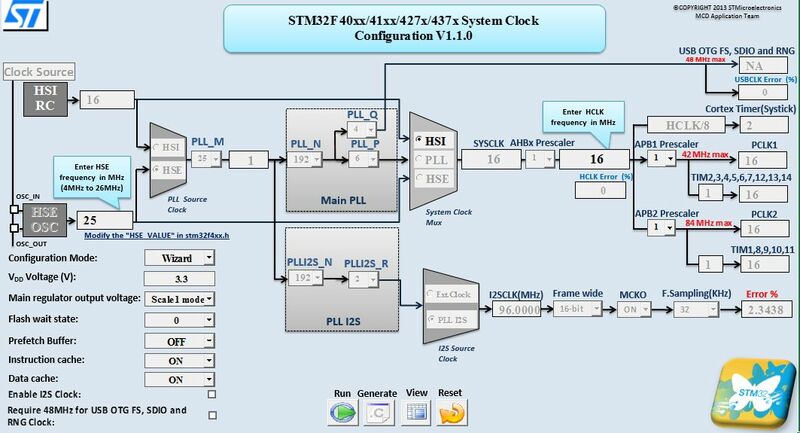 The Clock Configuration tool eases the configuration of the internal and peripheral clocks generating the source code for system_stm32f4xx.c automatically. When starting with a new development board I always revisit the fundamentals like GPIO. Doing this helps establish that the development tools are working and gives a basic library for future development. So with this post we will be looking at GPIO on the STM32 Discovery board. When Rediscovering the STM32 Discovery Board I mentioned that I would need to look at using either the standard peripheral library provided by ST or to use a lower level method of controlling the board. After due consideration I have decided to continue with the lower level access. Whilst this may be more effort it does lead to a better understanding of what is actually happening at the low level. Our objective today will be to toggle a GPIO pin (Port D, pin 0) generating a square wave. The result will be something similar to the Simple GPIO post for the STM8S. The STM32F4 Discovery board is a low cost development board for hobbyists, beginners and experienced users. The board uses the STM32F407VGT6 and hosts a number of sensors including digital accelerometer, push buttons, microphone and DAC. It also contains four built in LEDs which can be used to give feedback to the developer and breakout pins for the GPIO ports. The alternative functionality will be considered in future posts. The functionality of the 16 pins on each of the GPIO ports is controlled by a number of registers. The description of each of the registers can be found in RM0090 Reference Manual for the STM32 chip. This manual can be downloaded from STs web site. An overview of the registers follows; a fuller description of the registers can be found in section 7 of RM0090 Reference Manual (Revision 4). Where x is replaced by the port to be used. For instance, GPIOx_MODER refers to the generic mode register for a GPIO port. A specific instance of this would be GPIOD_MODER. This refers to the mode register for port D. Normally, x is in the range A to I and is defined by the specific version of the STM32 being used in the project. The STM32 has four configuration registers for each of the ports. Each of these registers is 32-bits wide although not all of the bits are used in all of the registers. The bits in the register are read/write and are in consecutive pairs. So bits 0 & 1 define the mode for pin 0, bits 2 & 3 define the mode for pin 1 etc. This is a 32-bit register but only the lower 16 bits are used. The top 16 bits are reserved and should not be used. This register uses a single bit for each pin to define the output type of the pins in the port. So, bit 0 defines the output type for pin 0, bit 1 for pin 1 etc. The default reset value for all of the GPIOx_TYPER registers is 0x0000 0000 meaning that all ports are configured for push/pull output. The reset value for these registers is 0x0000 00C0 for port B and 0x0000 0000 for all other registers. The two data registers for each port indicate the input/output state of the port. Each of the registers are 32-bit registers but only the lower 16 bits are used. The top 16 bits are reserved and should not be used. The input data register indicates if a high or low signal has been applied to the pin within a port. The register is read-only and the whole word should be read. As with the output type register – GPIOx_OTYPER, the bits in the register map onto the pins in the port (bit 0 maps to pin 0, bit 1 to pin 1 etc.). The reset value for all of these registers is 0x0000 XXXX where X indicates that the bits are unknown as they will be defined by the input signals applied to the pins are reset. As with the output type register – GPIOx_OTYPER, the bits in the register map onto the pins in the port (bit 0 maps to pin 0, bit 1 to pin 1 etc.). The bits in the lower 16 bits of the register are all read/write bits. The reset value for all of these registers is 0x0000 0000. A more effective way of setting/resetting a bit in the output register is to use the bit set/reset register. The set/reset register sets or resets a single bit in the output data register. This is a 32-bit register and it is split into two halves, the lower 16 bits are used for setting a bit and the upper 16 bits are used for resetting a bit. This is a write only register; reading this register will return 0x0000. Setting a bit in the lower 16-bits of this register will cause the corresponding bit in the output data register to be set to 1. Similarly, setting a bit in the upper 16-bits of this register will cause the corresponding bit in the output data register to be set to 0. For the lower 16-bits the mapping is simple, bit 0 in GPIOx_BSRR maps to bit 0 in GPIOx_ODR etc. For the upper 16-bits, bit 16 of the GPIOx_BSRR maps to bit 0 of the GPIOx_ODR; bit 17 of GPIOx_BSRR maps to bit 1 of GPIOx_ODR etc. So why provide the set/reset functionality when you have the output data registers? The set/reset register provide an atomic method of setting or resetting an output pin on a port. When using the output data registers, the compiler will have to generate a number of statements in order to set or reset a pin. This can allow an interrupt to be processed when part way through the set/reset operation. By using this register it is possible to set or reset a pin using a single instruction. This means that the operation will complete before the interrupt can be processed. This register is used to lock the configuration of the port until the next reset of the chip. The register is a 32-bit register but only 17 bits are actually used. The lower 16 bits indicate which bit of the port configuration is locked. So setting bit 0 of the register will lock the configuration of pin 0 etc. The final bit used is bit 16 in the register (known as the Lock Key – LCKK); this bit determines the lock status of the port; a zero indicates that no lock is applied whilst a 1 indicates that the port configuration is locked. It is important to note that the values in bits 0 through 15 should not change whilst following the above sequence. Should they change or any error occur then the lock will be aborted. The final step, reading the lock bit, confirms the success or failure of the operation. The alternative function registers allow the configuration of the port to change from simple GPIO to an alternative function such as SPI MOSI. These registers are noted here but will not be discussed further as they will be covered in subsequent posts. This header file can be found in the Standard Peripheral Library as supplied by ST Microelectronics. A careful examination of the members of the struct within the typedef reveals that with one exception, the members of the struct all map directly onto the registers we have been discussing above. The one exception is the BSSR register. This has been split into two components BSSRL and BSSRH. This split nicely maps to the difference in functionality of the two halves of the register, namely Setting and resetting of individual bits in the output data register. GPIOD->MODER = 0x01;    // Set Pin 0 of Port D to input. The second application will make use of the on board LEDs. This will require a little more coding in order to provide a delay between turning the LED on and off in order to make the flashing visible to the naked eye. //  Initilaise the GPIO port. One thing to note from the above code is that we need to initialise the peripheral clocks (this should be taken as read for the moment and will be covered in future posts). When initialising the GPIO port we should take into consideration the default clock speed of the Discovery board after reset. By default this is 8 MHz and so we should set the speed of the output port accordingly. This leads to a configuration for pin 0 of output with a maximum speed of 25 MHz, push pull with not pull-up or pull-down resistors. Once initialised we enter the main program loop. Here the application uses the set/rest registers to toggle pin 0. This shows how the 32-bit register is split into two, one for the set and one for the reset operation. And there we have it, our first application deployed to the STM32 Discovery board. This second example is really aimed at those who do not have access to an oscilloscope. Here we will slow down the output of the GPIO port and flash one of the built in LEDs. //  Toggle the selected LED indefinitely. Deploying this application should flash the selected LED just below the STM32 microcontroller on the STM32F4 Discovery board. This post presented two simple applications which toggle GPIO lines on Port D. Using these techniques and the additional information in the register descriptions you should be able to extend the application above to control digital devices such as shift registers etc. A simple SPI implementation using hardware SPI (single byte exchange). Software SPI implementation (using buffers to allow the exchange of data packets). Here we will build upon the buffering and overlay the the Netduino Go 1.0 protocol in order to allow the two devices to communicate. We will also extend the STM8S application to add a simple function table to allow the simple addition of extra functionality to the system. These forum members have given assistance in one form or another over the past few months and without their help this post would not have been possible. The early GoBus protocol uses an 18 byte data packet which is exchanged by the Netduino Go and the module. This packet of data contains a one byte header, 16 bytes of data and a one byte checksum with the data packets being exchanged over SPI. With the exception of the header and the checksum it appears that meaning of the data within the 16 byte payload is determined by the module developer. I would also point the reader to the blog post A Developers Introduction to GoBus by Matt Isenhower on the Komodex System web site. When the Netduino Go is first powered it will look at each of the Go Sockets in turn and attempt to interrogate the modules which are connected to the main board. It does this by sending out a packet with a single byte header 0xfe followed by 16 data bytes and a checksum. From experience, the data bytes are normally set to 0xff. The module attached to the socket is then required to respond with a header byte of 0x2a followed by the 16 byte GUID of the module and the checksum byte. The end result of this exchange is that the Netduino Go will have built up a list of modules attached to the main board along with the corresponding socket numbers. This process then allows the .NET code to connect to a module using the GUID or the GUID and socket number. Successful connection is indicated by the blue LED by the side of the socket being illuminated. A failed connection normally results in an exception being thrown. It appears that the meaning of the 16 byte payload is determined by the module developer. The protocol also allows for the use of a single GPIO. This can be used as a signalling line to let either side know that an action is pending. Convention appears to be to use this to allow the module to let the code on the main board know that there is some data/action pending. Perform a simple calculation and notify the Netduino Go that the result is ready. Send the result back to the Netduino Go when requested. This simple module illustrates the key types of communication which may be required of a simple module. It is of course possible to use these to perform other tasks such as controlling a LED or receiving input from a button or keypad. The Netduino Go code derived from the C# code published by Secret Labs in their Wiki. The major changes which have been made for this post are really concerned with improving clarity (adding comments at each stage to expand on the key points etc.). Modules are identified using a GUID. This ID allows the GoBus to connect to a module by scanning the bus for the specified ID. It also allows the Netduino Go to verify that when connecting to a module on a specific socket that the module is of the correct type. So the first thing we will need to do is obtain a new GUID. There are various ways in which we can do this and the simplest way to do this is to use the Create GUID menu option in Visual Studio. You can find this in the Tools menu. REMEMBER: It is critical that you generate your own GUID as each module will need to have distinct ID. Scanning down the file a little way you will find the two constructors for the class. One takes a socket and attempts to bind to the specified module on the requested socket. The other will attach to the first available module on the GoBus. This method is key to allowing the Netduino Go to connect to the module. The method binds to the module (assuming the IDs match) and retrieves a list of resources which the driver can use to communicate with the module. In this case, the SPI information and the pin used as an interrupt port. The remainder of the method configures the module driver to use these resources. One key point to note is the use of the AutoResetEvent object. This is used to allow the interrupt handler to communicate the fact that an event has occurred to the methods we will write. This can be done in a manner which is non-blocking. //  verify the checksum at this point. The first thing this the method does is to set up the _writeFrameBuffer with the header, the command number and the data we will be sending. 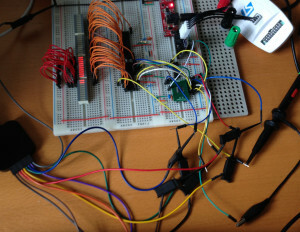 The data is then written to the module using SPI. responseReceived will be true if the interrupt has been generated and the C# module code has received the event. The response header (from the module to the Netduino) will be 0x2a followed by 0x80. This restricts the return payload to 15 bytes. The way in which the protocol has been implemented here also places a restriction upon on the application. Firstly, the module must receive a request as a full payload. Only then can the module respond. This is where the GPIO interrupt discussed earlier comes into play. The final part of the problem is to work out how to dispatch the messages received by the module. To do this we will use a function table. For the remainder of this article we will restrict ourselves to looking at the new functionality we will be adding on top of the previous post in order to allow the creation of a module. unsigned char command;          //  Command number. void (*functionPointer)();      //  Pointer to the function to be executed. //  Number of functions in the function table. Here we define a function table entry which has a byte ID and a pointer to a function (taking a void parameter list) associated with the ID. We then declare an array of these objects and associate functions with the IDs. The final line of code simply determines the number of entries in the function table. By performing these three simple steps you can add one or more functions with ease. The communication protocol will continue to work as is with no modification. The only exception to this rule will be cases where more than one payload of data needs to be transferred in order to achieve a specified piece of functionality (say a network driver etc.). unsigned char _rxBuffer[GO_BUFFER_SIZE + 1];    // Buffer holding the received data plus a CRC. unsigned char _txBuffer[GO_BUFFER_SIZE];        // Buffer holding the data to send. unsigned char *_rx;                             // Place to put the next byte received. unsigned char *_tx;                             // Next byte to send. int _rxCount;                                   // Number of characters received. int _txCount;                                   // Number of characters sent. volatile int _status;                           // Application status code. //  GUID which identifies this module. This method is simple and really just toggles which is connected to GPIO pin on the Netduino Go socket. //  GO! Function 2 - return the Tx buffer back to the GO! board. The implementation of the SPI processing here is interrupt driven. As such we will need to allow a method of synchronising the payloads we receive. This application will do this using the rising edge of the chip select signal which is generated by the Netduino Go main board. This allows us for cater for the many scenarios (synchronisation, underflow and overflow). In the case of underflow and synchronisation, the chip select signal will rise before we have enough data. In this case we have either a corrupt packet or we have started to recei8ve data part way through the packet. In this case we cannot sensibly process the data so we should throw away the packet and wait for the next one. An overflow situation can occur when the Netduino Go sends more than 18 bytes in one packet of data. In this case we should detect this and prevent the buffers from overflowing. //  on the GO! bus. //  Do not call this method whilst SPI is enabled as it will have no effect. (void) SPI_DR;                          //  Reset any error conditions. SPI_DR = GO_FRAME_PREFIX;               //  First byte of the response. _txBuffer = _moduleID;            //  Second byte in the response. //  Now reset the buffer pointers and counters ready for data transfer. //  but the header files have SPI_CR_CECEN defined. SPI_CR2_CECEN = 0;                      //  Reset the CRC calculation. Too little data received correctly. The rising chip select line will reset the buffer pointers and the data will be discarded. The correct amount of data received. In this case the buffer will be processed correctly. Too much data is received. The excess data will be discarded to prevent a buffer overflow. The ResetGoFrame method is key in ensuring that the buffers are reset at the end of the SPI transmission indicated by the rising chip select line. This method is responsible for ensuring that the data is transmitted and received correctly. It works in much the same way as the previous buffered SPI example. The main difference between this module and the previous example is what happens when the first byte of the data received is equal to 0xfe. In this case the Tx buffer pointer is moved to point to the module ID. This ensures that the Netduino Go receives the correct response to the enumeration request. The Protomodule has also been wired up for one particular module but at the time of writing the definitions have not been added to the sources. In order to connect the Netduino Go main board to a module in development you will probably need to purchase some form of breakout such as the Komodex breakout board (Straight connectors or 90-Degree connectors). Connecting the two boards should be a simple case of ensuring that the SPI pins are connected MOSI to MOSI, MISO to MISO, CS to CS and Clock to Clock. In the case of the Discovery board I used PB0 for the CS line and for the STM8S103 setup I used the standard pin PA3. Running the code should be a simple case of loading the STM8S code into the IAR development environment first and the deploying the code to the chip. Hot F5 to run the code. Next, load the visual studio code and deploy this to the Netduino Go main board. Hit F5 to run the code. The C# code running in Visual Studio should start to print some diagnostic information to the debug window. You should see a series of statements of the form Adding 5 to 6 to give 11. The 6 is the parameter which has been sent to the module for processing and the 11 is the result. I have seen differing behaviours to the way in which the debugger in IAR works with the code in the module. Occasionally the debugger will actually prevent the module from enumerating. This will result in an exception in Visual Studio. To date I have only seen this behaviour with the STM8S103 setup. The STM8S Discovery board seems to work correctly. If you have problems with this then the only suggestion is to detach IAR from the board and rely upon diagnostic information being dumped to a logic analyser. You will note that the test application which runs on the Netduino Go has the instantiation of the module wrapped in a while loop and a try block. This allows the test code to make several attempts at creating a new module instance. This should not be necessary in the final production code as this has not yet failed in a none debug environment. 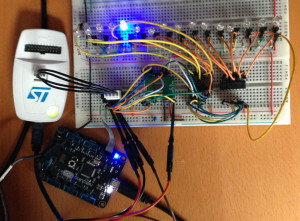 This code has been tested with the simple module example here and also with a temperature and humidity sensor. The application enumerated OK and has been soak tested in two environments over a period of hours. The code seems to be stable and works well with the Netduino Go. I originally tried to be ambitious with the interrupt service routine dealing with the chip select line. This gave me code which was simpler but lead to a timing issue. 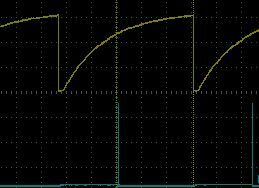 As it stands at the moment, dropping the chip select line from high to low starts the SPI processing. The time between this happening and the first clock transition is only 3.25us as measured on my logic analyser. This means that all of the preparation must be completed in 3.25us. The two markers 1 & 2 indicate the time we have between the start of the comms indicated by CS falling to the first clock pulse. The Status Code trace is a debugging signal generated by the application. 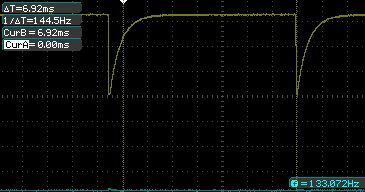 The rising edge indicates when the first line of the interrupt service routine for the CS line starts and the falling edge indicates the point where we have completed enough processing to allow SPI to be enabled. This post shows how we to create a Netduino Go module using a standard communication protocol. Additional module functionality can simply be added by adding to the function table. As noted at the start, this article is the combination of information provided by Netduino community members along with the module code which can be found in the Wiki. As usual, the source code for this application is available for download (STM8S Go Module and Netduino Go – Basic Module Driver).